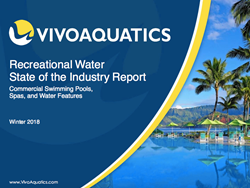 VivoAquatics Announces State of Market Study on Risks, Challenges and Trends in Managing Recreational Water at Resorts, Hotels and other Commercial Facilities. Publication includes analysis of over 7,000,000 data points and hundreds of facilities to provide first data driven assessment of water safety and management. VivoAquatics, the leader in providing innovative and sustainable aquatic solutions, has just announced the publication of the first data driven assessment of water safety and management: “State of Market - Recreational Water Safety in Commercial Facilities”. The report, the result of analyzing over 7,000,000 data points and surveying hundreds of commercial hotels, waterparks, apartment buildings, fitness clubs and municipalities is the first publication of its kind to provide detailed analysis of water safety and management practices in commercial properties. The State of the Market report also provides insights into emerging regulations, trends and technologies that properties are using to be more proactive in creating safe and efficient water experiences. The management of commercial swimming pools, spas, fountains, and water features has come under increased scrutiny in recent years as properties face challenges maintaining compliance with state and local laws, lowering water usage to meet corporate sustainability goals and reducing energy costs associated with the sanitation, circulation and filtration of water. The State of the Market report outlines where risks are most prevalent as well as core strategies organizations are taking to improve guest satisfaction, reduce costs and mitigate such risk. "Brands and facilities are spending hundreds of thousands of dollars a year to maintain their water features while also seeing an increase in litigation due to outbreaks of disease and poor water chemistry techniques,” said Richard Lindhorn, Director of Development for VivoAquatics. “Our analysis of millions of data points across hundreds of properties identified that while water safety challenges remain, it’s clear that organizations are taking more proactive measures to address these challenges through automation, monitoring, more sustainable products and innovative processes." With a focus on reducing liability and increasing operational efficiency, VivoAquatics regulates safety and improves the guest experience with a complete online pool management system as well as fully automated chemical dosing systems. Experts in aquatic care, VivoAquatics strives to find innovative solutions through sustainable practices and provides services such as energy saving assessments, quality control support, remote monitoring and full operational support with state-of-the-art systems. The brand maintains quality and staff proficiency with onsite installations and dedicated service and staff training, and works in partnership with leading hospitality brands such as St. Regis, Westin, Hilton, Marriott, Ritz Carlton, W Hotels and Sheraton. For more information on VivoAquatics, please visit http://www.vivoaquatics.com.